Please call ahead for open bowling, lane availability may change due to league schedules, tournament, schedule groups, etc. Le Ella Lanes is a family owned and operated bowling center located just West of Washington Court House across the road from the Fayette County Fairgrounds. We offer open bowling, leagues, birthday parties,holiday parties for small and large groups, team building, office get together and the best pizza and subs in town made to order from our pizzeria Amore' Pizzeria. 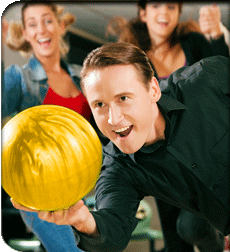 Le Ella Lanes offers several all inclusive birthday packages for parties of 6 or more. Bowling, shoes, and food is provided, and some packages include a professionally decorated cake from 2 Scoops of Sugar. Please call for details and available dates and times. A $40.00 non refundable deposit required on all packages. Le Ella Lanes offers several all inclusive birthday packages for parties of 6 or more. Bowling, shoes, and food is provided, and some packages include a professionally decorated cake from 2 Scoops of Sugar. Please call 740-335-2580 for details and available dates and times. A $40.00 non refundable deposit required on all packages.